Day two of WasteExpo 2017 brings more news from exhibitors. The Closed Loop Foundation, Mack, Norgren GT Development Corp., Trelleborg Wheel Systems, Caterpillar, McNeilus Truck & Manufacturing and the Solid Waste Association of North America all had news to report. 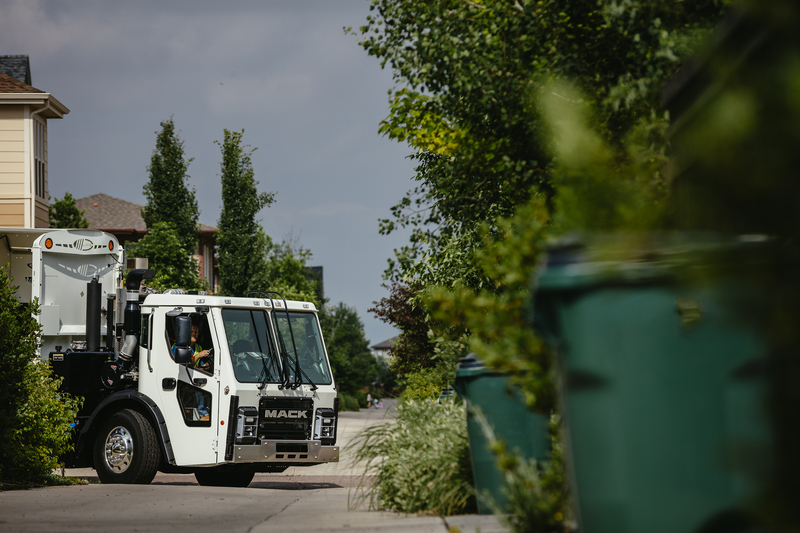 Mack Trucks’ low-entry refuse cabover, the Mack LR model, is now available in a 4x2 configuration, giving customers a lighter, more maneuverable option for refuse collection. Mack made the announcement at WasteExpo 2017. With a shorter wheelbase and tighter turning radius, the 4x2 LR model has the ability to fit into alleys and other small spaces. The 4x2 LR model is also lighter than its 6x4 counterpart, improving handling. LR models in 4x2 configuration are available now for order. Launched in 2015, the Mack LR model was engineered to meet the specific challenges of the refuse application. Customer input was incorporated into the cab design to deliver improved productivity through superior driver comfort, safety and visibility. The cab’s enhanced driver environment includes power windows and power door locks, memory mirrors, in-dash air-conditioning, standard in-cab LED lighting and an instrument cluster with color LCD display. HVAC and radio controls are centrally-mounted and accessible from both driving positions. A tilt and telescoping steering column is also standard and features steering column-mounted main gauge pods for both the right-hand and left-hand driving positions to enhance gauge visibility and improve ergonomics. The LR model was also designed with expansive front glass to provide unparalleled visibility. Wrap-around rear cab corner windows we also added to improve visibility and safety. A new center storage space for lunch coolers, two-liter bottles, beverage cups, mobile phones and MP3 players was added, as was a rear-wall unit that offers two additional levels of storage. All LR models are powered by Mack’s 11-liter MP-7 diesel engine with up to 355 horsepower and 1,260 lb.-ft. of torque. The Cummins Westport ISL G natural gas engine is optional. LR models are equipped with an Allison RDS five-speed or six-speed automatic transmission. The LR model was also designed with body builders in mind and offers additional access points and mounting locations for wiring, controls and joysticks. Customers requiring additional support can turn to Mack’s new online Body Builder Portal, which brings together all of Mack’s body builder resources into one convenient online location. Resources available through the portal include wiring schematics, a PTO pump speed calculator and more, as well as contact information for Mack’s Body Builder Support Group. Mack Trucks also announced that Mack Over The Air (OTA) will be available on refuse vehicles including the Mack 2018 Granite, TerraPro and LR models equipped with Mack 2017 GHG engines. Mack OTA allows customers to update software without disrupting their schedules, improving efficiency and increasing uptime. Mack OTA will be available on 2018 Mack LR models equipped with a Mack engine with the availability of GuardDog Connect beginning in the third quarter of 2017. Mack OTA for the TerraPro and Granite models is also planned for later in 2017. GuardDog Connect comes standard on every Mack model equipped with a Mack engine and provides proactive monitoring and repair planning, enabling real-time diagnosis of issues, scheduling of repairs and confirmation that needed parts are in stock and ready to install. Combined with Mack ASIST and Mack’s live OneCall uptime agents, GuardDog Connect delivers the right mix of people and technology to provide decision-critical information to maximize customer uptime. Mack’s uptime functions are based at the Mack Uptime Center, a 123,000-sq.-ft. facility that houses personnel from every customer support function. Through the latest telematics, communications and case management tools, the Uptime Center allows Mack uptime agents to work through cross-functional teams and address customer needs quickly and efficiently. Motion and controls company Norgren GT Development Corp., in conjunction with transportation technology company Aktv8 LLC, introduced the revolutionary iLift intelligent lift axle control system designed to autonomously deploy and proportionally control the lift axle, keeping trucks load-legal without driver intervention. The innovative iLift system was unveiled at WasteExpo 2017.
a) Automatic lift and deploy for driver focus and consistency. b) Optimized load on drive axles for improved traction and braking. Trelleborg Wheel Systems debuted the Brawler HPS Soft Ride, a new solid tire designed and developed specifically for the waste management and recycling industries, at WasteExpo. McNeilus Truck & Manufacturing announced the strengthening of its strategic alliance with natural gas industry leader Agility Fuel Solutions at WasteExpo 2017. The newly strengthened alliance is designed to offer fleets a broad and differentiated offering of designs and capacities to meet the needs of any customer. For instance, McNeilus will now be authorized to process claims, provide parts and service for Agility’s CNG systems and conduct Agility CNG installations throughout its branch network. Agility’s strategic partnership with Cummins, the leading provider of engines to the trucking industry, has produced Blue iQ, an integrated engine and fuel system with performance enhancements, diagnostics improvements and telematics services. Ultimately, customers will receive a world class customer experience and benefit from the products and services of all three proven market leaders. Supporting the Solid Waste Association of North America's (SWANA) goal of promoting safety within the solid waste industry, SWANA has developed a new installment to its “Five to Stay Alive” series that features safety tips for Material Recovery Facility (MRF) employees. The number of MRF worker fatalities increased over the previous year, and the multitude of injury hazards at recycling facilities remain high. The complex and fast-paced environment of a modern MRF requires well-trained and educated employees and employers. The “Five to Stay Alive” safety campaign includes flyers and posters that provide a useful set of guidelines for employees to follow in order to reduce accidents and injuries on the job. SWANA encourages waste industry professionals to use this tool, in addition to its other safety resources, to continue efforts in creating a positive workplace safety culture, in order to move the solid-waste industry off of the federal government’s list of most dangerous jobs. “Five to Stay Alive” resources are available for download on the SWANA website for easy sharing in promoting safety to colleagues and other industry professionals. The Spanish version will be available in June. The Closed Loop Foundation, an independent 501c3 supported by investment platform Closed Loop Partners, has launched a research initiative to uncover existing and necessary capital investments in recycling infrastructure and the development of the circular economy. As a result of this analysis, investors interested in strong financial and environmental returns will have actionable insights for deploying capital in this space. The study, which is supported by grants from Goldman Sachs Center for Environmental Markets and Wells Fargo Foundation, is seeking perspectives from capital providers and seekers working across the system–from residential curbside collection to advanced technologies and materials sciences. “No one has yet been able to capture the capital investment available or needed to truly close the loop on post-consumer waste. A lack of data is a significant barrier for investors,” Foundation Board Chair Ron Gonen said in a statement. The goal of the study is to provide stakeholders with practical guidance on investable opportunities across a wide spectrum of types and sources of capital. It will highlight deals across all aspects of circular infrastructure – from design and manufacturing, to collection, sorting and processing. A public report will be available later this year. Closed Loop Partners also plans to host events to help interested parties act on the report’s findings. Cat rolled out updates to its 836, 826 and 816 model landfill compactors. The new 562-gross horsepower Cat 836K landfill compactor advances the solid engineering of its predecessors with a redesigned cab, an engine that meets U.S EPA Tier 4-Final (EU Stage IV) emissions regulations, new wheel and tip configurations, and enhanced safety and serviceability features. For operator convenience and added productivity, the 836K's Auto-Blade feature automatically raises the blade when the machine reverses and lowers the blade to a pre-set height when it moves forward. The STIC steering controller uses a single lever for steering and transmission control, allowing the operator to sit comfortably back in the seat, significantly lessening fatigue. Available are a heated seat and radio options, including Bluetooth, MPS, or satellite. The 836K' s Cat C18 ACERT engine uses selective catalytic reduction to control nitrogen-oxide emissions and the Cat Clean Emissions Module—diesel particulate filter (DPF), diesel oxidation catalyst, and Cat Regeneration System—to control particulate emissions. DPF regeneration is automatic and does not interrupt the machine's work cycle. For added efficiency, an auto-reversing, hydraulically driven fan adjusts its speed to match cooling requirements, reducing horsepower draw and conserving fuel. The 836K can come equipped with one of 3 new wheel and tip configurations to meet a particular application. The new Paddle Tip offers high performance and less fuel burn with more traction and less weight. The Plus Tip has a traditional design for increased side slope stability and the Combination Tip merges both paddle and plus tips to give high performance with side slope stability. The Cat 826 Landfill Compactor has set the design standard for this demanding application since 1978, and with the introduction of the K Series model, that design is further advanced in terms of operator comfort and safety, ease of operation, durability, reliability, low-cost operation, and productivity. Two Cat C15 ACERT engine options are available, meeting U.S. EPA Tier 4 Final/EU Stage IV emission standards or U.S. EPA Tier 3/EU Stage IIIA equivalent emission standards. It delivers 405 net horsepower (302 kW) to the 826K's drive train, which uses a 2F/2R planetary power-shift transmission, lock-up torque converter, and heavy-duty planetary axles that can accommodate three new wheel-and- tip configurations. With an operating weight of 90,207 pounds (40 917 kg), coupled with massive structures that remain solid through a number of rebuilds, the 826K is built for rugged durability. For fuel-saving performance, the 826K features an Eco Mode, which, when selected by the operator, limits engine speed and allows the machine to function in an auto-shift mode when maximum torque is not required. For operator convenience, the left pedal serves as a brake, transmission neutralizer, and engine decelerator, which the operator can use to temporarily override the engine speed set with the throttle lock for safely maneuvering around obstacles. And for optimum responsiveness and control, the 826K's STIC system allows single-lever steering and transmission control. The new Cat 816K landfill compactor builds on the established performance, durability, and reliability that the model 816 has demonstrated since 1972. The new K Series model, designed with heavy-duty main structures that support multiple life cycles, features a fuel-efficient Cat C7.1 ACERT engine, single-lever steering, pressurized cab, and wheel/tip options that provide extended service life. Available Cat COMPACT Technologies, such as Compaction Control, further enhance compaction performance and consistency by providing accurate compaction values and 3D mapping. The 816K’s Cat STIC Steering and Transmission Integrated Control combines steering and transmission control (directional and gear selection) into a single lever. Simple side-to-side movements of the low-effort lever provide precise steering maneuvers through 42 degrees of articulation right and left. Electro-hydraulic implement controls use soft detents, and cylinders use electronically controlled stops for smooth operation. The left pedal serves as a brake, transmission neutralizer, and decelerator that overrides the engine-speed setting. The Cat Vital Information Management system (VIMS) notifies operators and technicians about potential problems, allowing issues to be resolved quickly, preventing unscheduled downtime. In addition, Cat LINK technologies wirelessly provide equipment managers with critical information, via the VisionLink® interface, including machine location, hours, fuel usage, idle time and event codes.